The Yaesu FT-857D is one of the most successful multi-band HF / VHF / UHF and multimode AM / FM / SSB / CW / PACKET mobile transceiver in the world. It covers in reception the bands of 0.1 to 56 MHz, 76-108, 118-164 and 420-470 MHz and in transmitting on all amateur radio bands from 160m to 70cm. Successor of the famous FT-857, the D version indicates the addition of the new amateur band 60 meters (5Mhz) and the DSP filter. The ergonomic layout of the large VFO knob ensures easy mobile operation. 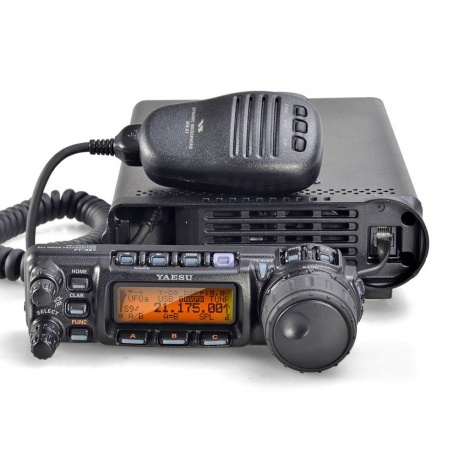 The FT-857D has a comfortable power of 100W in HF, 50W in VHF and 20W in UHF. The front panel is detachable and the station can be controlled via the separation kit YSK-857 supplied. The modification of the FT-857 D is possible in export mode. 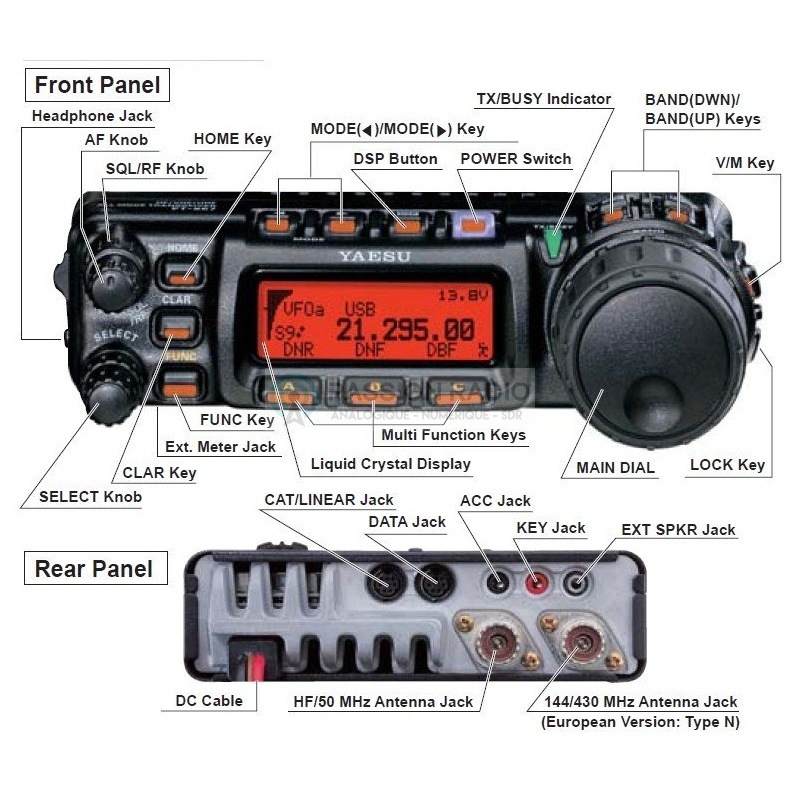 Comes complete with: FT-857D HF mobile 100W, hand microphone MH-31A8J, microphone clip, 13.8V DC power cable with fuses, manual to dowload below. 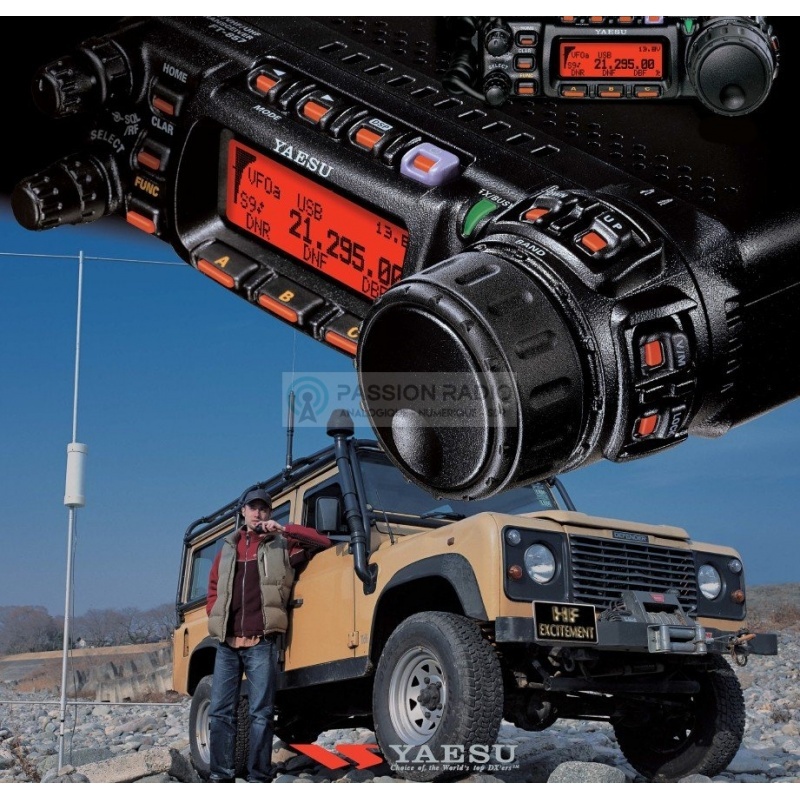 Description: The Yaesu FT-857D is one of the most successful multi-band HF / VHF / UHF and multimode AM / FM / SSB / CW / PACKET mobile transceiver in the world. It covers in reception the bands of 0.1 to 56 MHz, 76-108, 118-164 and 420-470 MHz and in transmitting on all amateur radio bands from 160m to 70cm. Successor of the famous FT-857, the D version indicates the addition of the new amateur band 60 meters (5Mhz) and the DSP filter. The ergonomic layout of the large VFO knob ensures easy mobile operation. The FT-857D has a comfortable power of 100W in HF, 50W in VHF and 20W in UHF. The front panel is detachable and the station can be controlled via the separation kit YSK-857 supplied. The modification of the FT-857 D is possible in export mode. Comes complete with: FT-857D HF mobile 100W, hand microphone MH-31A8J, microphone clip, 13.8V DC power cable with fuses, manual to dowload below.